Skillet is an American Christian rock band formed in Memphis, Tennessee in 1996 and based in the United States. The band currently consists of husband and wife John (lead vocals, bass) and Korey Cooper (rhythm guitar, keyboards, backing vocals), along with Jen Ledger (drums, vocals) and Seth Morrison (lead guitar). The band has released nine albums, two receiving Grammy nominations: Collide and Comatose. Awake has been certified Platinum and debuted on No. 2 on the Billboard 200, with Comatose certified Gold by RIAA. Skillet went through several line-up changes early in their career, leaving founder John Cooper as the only original member remaining in the band. They have sold over 2 million albums in the U.S. alone and are known for a relentless touring schedule, which garnered them a top five ranking in the Hardest Working Bands of 2011 by Songkick.com. Thousand Foot Krutch (often abbreviated TFK) is a Canadian rock band formed in 1995. They have released eight albums. They have also released one live album and three remix albums. Singer Trevor McNevan and drummer Steve Augustine are also members of their own side project band called FM Static and Joel Bruyere started his own solo project called "The Drawing Room" in 2009. The band has sold a million albums as of February 2014. Trevor McNevan founded the band in Peterborough, Ontario, a city northeast of Toronto, where he went to high school. Joel Bruyere, born in Brantford, Ontario, was McNevan's childhood friend who had moved away but remained in contact with him. Drummer Steve Augustine is from Hamilton, Ontario. 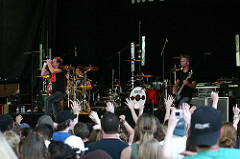 McNevan's first band was Oddball, which featured Dave Smith on guitar, Tim Baxter on bass and McNevan's good friend, Three Days Grace's Neil Sanderson, on drums. Oddball recorded only one album, Shutterbug, which was released in 1995. 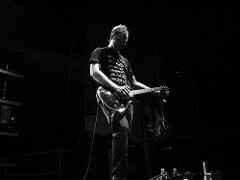 McNevan is the founding member of TFK (along with original guitarist Dave Smith), formed in 1997 in Peterborough, Ontario. McNevan came up with TFK's name "symbolizing the point in our lives that we realize we can't make it on our own strength". He has written and released seven albums with Thousand Foot Krutch to date and another four with his side project FM Static. Fireflight is an American Christian rock band formed in Eustis, Florida in 1999. The band is signed by Flicker Records. They have played in ShoutFest, Revelation Generation, and have been featured on The Scars Remain tour with Disciple, Family Force 5, and Decyfer Down. While touring, they wrote their third album, Unbreakable (2008), and released their first single off the album, "Unbreakable". They performed at Winter Jam 2010 and released their fourth full-length album For Those Who Wait in February. On December 1, 2010, they were nominated for their first Grammy award. In 2012 they came out with their fifth full-length album Now. Copyright © 2016 Kandan Evans, BMCC, CC Free to use. All Band biographies and information taken directly from Wikipedia.